(October 2, 2013). 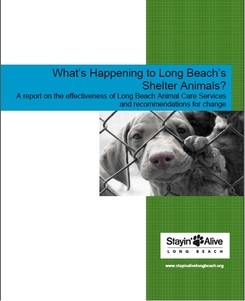 Stayin' Alive Long Beach has published a report entitled "What's Happening to Long Beach's Shelter Animals? : A report on the effectiveness of Long Beach Animal Care Services and recommendations for change." Download the report graphs here. Stayin' Alive Long Beach's response to ACS's comments in the October 5 Press-Telegram article.